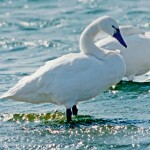 Usually silent, but males will give a soft whistle during courtship. 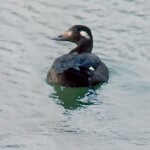 Description: Black back and breast, gray sides, vertical white stripe in front of folded wings, iridescent purple head, blue bill with two white bars and a black tip. 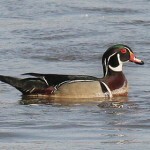 Female is brown with a similar bill. 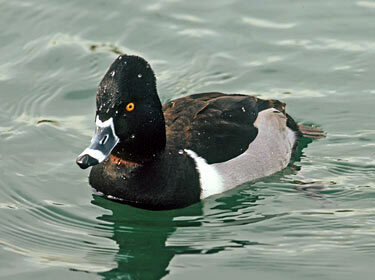 Habitat: Divers, like the Ring-necked Duck, use large lakes and reserviors during migration. In the breeding season they use acidic bogs and swamps bordered by shrubby cover. Where in Nebraska: Common, locally abundant, regular spring and fall migrant across the state. Rare casual summer visitor statewide and an uncommon casual winter visitor. No recent breeding records for Nebraska. Field Notes: Additional Information: Name comes from its cinnamon collar, but the collar is often hard to see in the field. Fun Facts: The Ring-necked Duck has an iridescent collar around its neck giving it its name even though it has a white ring around its bill which is seen more in observation. The Ring-necked Duck was named such because the bird was first discovered and identified from dead specimens.